Google has developed an Autofill add-on for Google sheets to predict unknown or blank values with machine learning. Google sheet is the online spreadsheet that lets you create and share the sheet within your company or group and allow you to collaborate with others in real time. The new smart Autofill add-on will uses the Prediction API, which is cloud based machine learning service developed by Google for performing Machine Learning directly in a Google Spreadsheet. After the add-on is installed, you would be able to see a menu item under “Add-ons” called “Smart Autofill”. 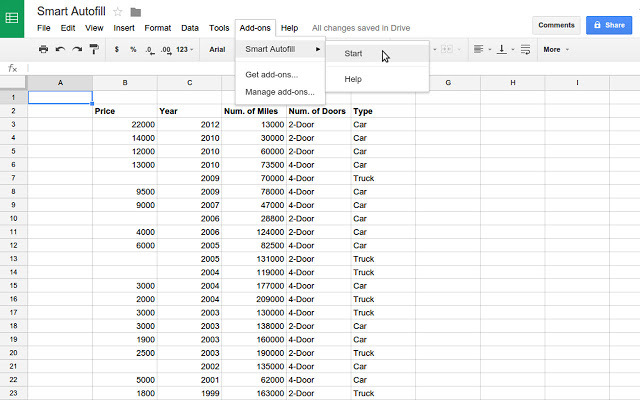 Google explains the function of Smart Autofill Spreadsheets Add On with this example. Software engineer Konstantin Davydov and research scientist Afshin Rostamizadeh wrote in the blog post, “Much of Google’s work on language, speech, translation, and visual processing relies on machine learning, where we construct and apply learning algorithms that make use of labeled data in order to make predictions for new data. What if you could leverage machine learning algorithms to learn patterns in your spreadsheet data, automatically build a model, and infer unknown values? To apply Smart Autofill in your spreadsheet, select “Smart Autofill > Start”. Then a sidebar will open. Select a block of data that includes the column to Autofill and click “Next”. From the selected data, choose the column to Autofill and click “Start” to begin Autofilling. Be ready to use the predictive power of Google machine learning.